Men and women may not come from different planets, but quite a few differences exist between the genders. One of these dissimilarities relates to facial rejuvenation. With more men considering non-surgical cosmetic enhancement, it’s important for patients to seek out skilled injectors who have a distinctive approach for their male clients. Dr. Eugenie Brunner, our experienced facial plastic surgeon, performs all injections at our practice. She will develop a customized treatment plan that suits the unique anatomy of each individual. Men tend to have thicker skin and more sebaceous hair follicles than women. As a result, they typically see fewer fine lines. Men also often need more contouring along the mid-facial region, as the parotid glands (located on either side of the mouth near the jaw hinge) can become enlarged and give the appearance of having soft, rounded cheeks. BOTOX® Cosmetic can be utilized to “slim” these glands while thicker dermal fillers, such as JUVÉDERM VOLUMA™, Radiesse®, and Perlane®, can be administered to provide lift and volume on the cheekbones and define the jawline. A benefit of the thicker hyaluronic acid-based dermal fillers is they are often longer lasting, requiring fewer “touch-ups” than their thinner counterparts. Men also tend to experience less downtime after cosmetic injectable treatment. Their thicker skin can provide natural protection from bruising, since the fillers must be administered more deeply into the skin. Some redness may still occur, depending on the patient’s skin tone—fair skin often experiences more ruddiness; however, this typically resolves within a few hours. Dr. Brunner recommends taking arnica montana supplements prior to and following treatment to further limit the potential for bruising. 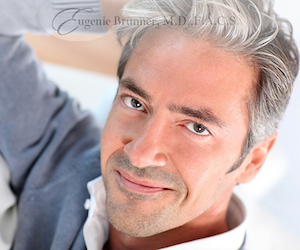 For more information about injectable treatment for men, or if you wish to schedule a consultation with Dr. Brunner, please contact us today.